My dear ladies and the occasional gentlemen, I went for a lovely walk this morning with hirsute Roley and Ronald. Had a bit of bother with Ronald as he wanted to watch a film but I explained he needed some exercise first. Well it was like taking a SULKY CHILD, he complained it was too cold and he couldn’t find the right hat. Once we were off he complained that the wind was BITTER which it wasn’t, that he had the WRONG TROUSERS on and finally that his tea was sloshing around in his tummy. “Listen” he says as he’s waggling his stomach about. Needless to say I did the same as you would to a GRUMPY child and ignored it. However when we were back home he did a good thing. I had taken three VINTAGE KNITTING BOOKS that were my grans and passed on to me, to scan some of the pictures for a poster, here is one of a very glamorous LADY. Ronald picked one up to look through and found a PHOTOGRAPH of my grandparents and my father. In a second book he found the DOCUMENT you can see in the second photograph. 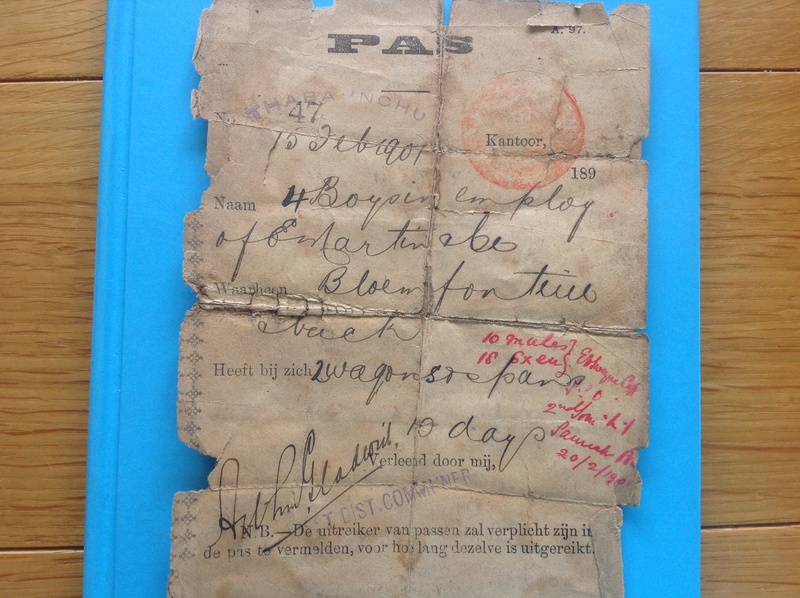 It is dated February 1901 and from what I can work out is a pass from THAB NCHU to BLOEMFONTEIN in SOUTH AFRICA. for 4 BOYS, 2 WAGONS, 10 MULES and 18 OXEN. This date is during THE BOER WAR. How fascinating a DOCUMENT it is. I will try and discover where and what it relates too.